All piping fabrication is performed in compliance with each project’s specifications and inspection criteria. These inspections are performed by qualified – CWI certified inspectors on our shop floor during production. In addition to the PSI CWI inspectors, Piping Systems, Inc. has additional production workers that also carry CWI certification. Each production bay has its own CWI inspection leader. 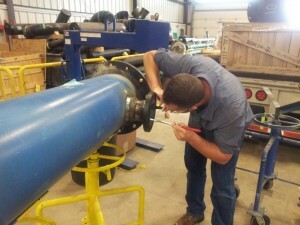 As a minimum, each pipe spool is 100% visually inspected for materials, spool configurations as shown on each spool drawing, weldments, and THE dimensional verifications are documented. Any non-conformances found are red tagged for resolution and/or repair prior to final acceptance approval. 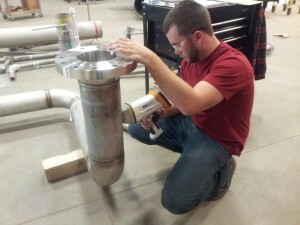 Piping Systems, Inc. QC staff includes ASNT Level II and AWS-CWI inspection certifications. In addition to PSI’s internal qualifications, PSI utilizes the qualified sub-contracted services of nationally recognized ASNT Level II & III third party inspections and documentation.